ReadOnly – for reading only. They are changed through form objects because only variable representation and not the meaning within the business process is concerned. Take a look at this script example that almost completely changes the task form when a different contractor is selected. This script is called when the Customer Type variable is edited and when the form is loaded. 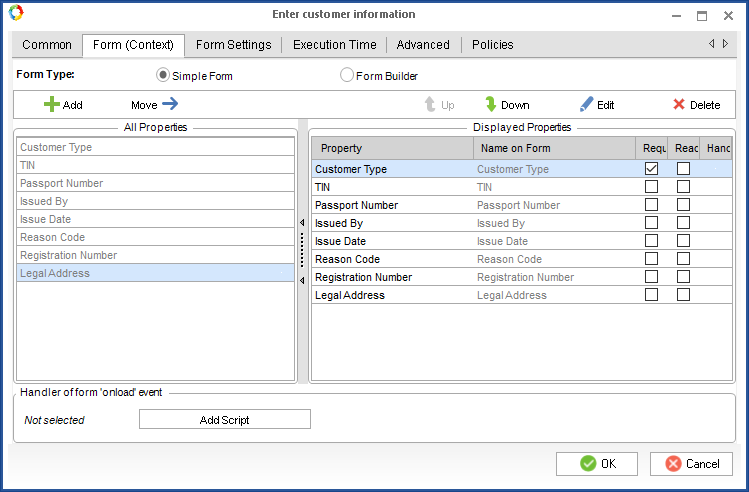 When the form is opened for the first time while the Customer Type is not yet specified, catch is used, because the first checking will return a blank value error. Depending on the Customer Type value, the script will change the Required and Visible properties for all the other variables in the form.